@fkchang you know, i've always thought a pull request or fork of jsbin would be an incredibly useful approach along with an integration of the repl. it would definitely give opal more exposure to boot if it were integrated into the core. https://www.reddit.com/r/ruby/comments/3bi3qx/opal_playground_like_js_fiddle_but_dom/ Comments are flowing in on Reddit. Looks like you're loading Opal over insecure HTTP (no 's') and chrome won't let me load the page . So should I push my current 'embedded in the iframe, but not too good looking or response opal-irb' that I have displayed in the screen shot? If I uncomment the explicit setting of the class it works. Maybe you could push a 'staging' that we can all QA off of and let you know. Is that what you're worried about? Bugs / compat issues? btw @JikkuJose I don't see anything wrong with that code... I suspect its because Element is just a thin wrapper on Jquery and hence does not work. But I'm not sure. Folks: Is there any known problem with circular requires? I have several classes that end up with a circular dependency. Lissio's way (doesn't have to be lissio, but no other framework does it) of combining markup, style and behavior into 1 coherent ruby class is both more productive, and responds to increasing complexity better. And like wise its pretty obvious you could have a great development environment where you developed these classes in a very interactive environment. The whole thing could be somehow backed by github, so you have builtin config management too. @fkchang - yes I hate that too, but there are folks in the react.js world who have tools that allow the css to be nicely placed right in the component. I want to look into that for opal-react. @catmando nice, got some links so I can see what they are doing? Why don't we set up a time, and I can get a staging version of what we have up and running and then do some code walk throughs and show you how it works. How does that sound? @fkchang - re: the editor. Exactly the idea. 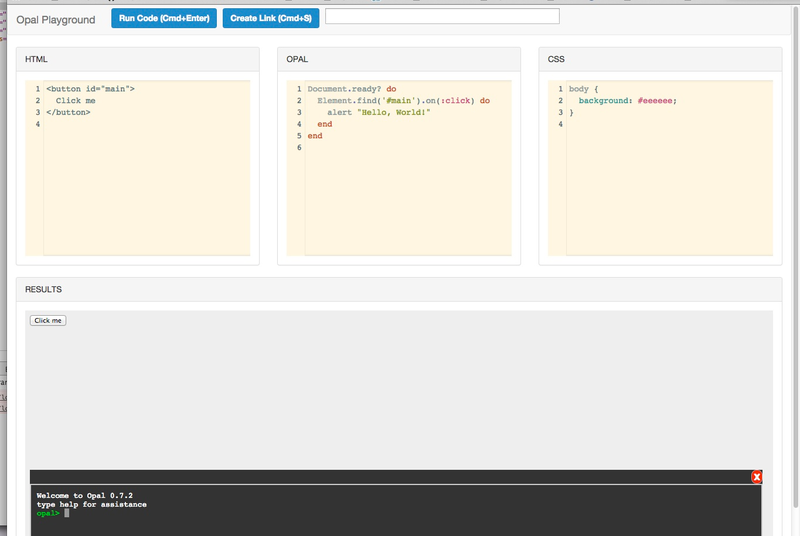 works good with react to, as each component = a class, so if you had a class editor then it = a component editor. ANd because react is well reactive, then it should be almost no work to make saving the changes == a render update! @fkchang - yes it would be nice to have some way to pull in various components depending on what people are doing. @fkchang - well lets set a time! We can do it gitter tomorrow perhaps. To be clear... we are NOT doing the CSS thing in react (YET) but I am thinking we will just grab it right out lissio. It would work just the same I think. as the css seems redundant. @catmando what time zone r u in? east coast. My only constraint though is my wife is returning from west coast tomorrow sometime so it would be best to do it before that. @catmando when does ur wife return? @re lissio... understood. 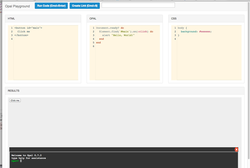 In react.rb you include React::Component and then all the generator methods are available within that class. then you need to attach the class to some dom element. There is a lot of magic being done to make the syntax very noise free, and I would have to think about what happens if you redefine the component. Should work....I will do a smoke test later and see what happens. @fkchang - not sure, but she is coming from Seattle so I am guessing pretty late... let me see if I can get txt her now. @ktec can you post any of the errors just to start from something? hi guys, so the first problem is the inheritance, I would like to use the benefits of ruby and implement the base.rb class here https://github.com/globalkeith/opal-pixi/blob/master/lib/opal/pixi/base.rb and include it, as an example here: https://github.com/globalkeith/opal-pixi/blob/master/lib/opal/pixi/container.rb however when I include it, it runs the x-string stuff, but the instance methods are no longer available. @ktec, I am missing where you are doing teh include?